When I left home at the ripe ol' age of 18, I knew how to cook the following "meals:"
So clearly, I had no cooking skillz whatsoever. But, I'm a pretty smart girl and can follow directions reasonably enough, so before too long I asked my mom for her tried-and-true recipes and started making them myself. After I got a hang of that, I became braver still and perused the internet for recipes I could call my very own. I quickly realized that cooking can be fun and even artistic! Buuuuuut ... I'm still not a pro by any means. I ain't no Julia Child and probably won't ever be. So, when cooking for my family, I tend to gravitate towards recipes that are simple but fresh. My taste buds prefer food that way, too. I love how it is printed on thick, matte cardstock with a ring in the corner, like a flip chart. Much more practical than a book that refuses to stay open while you're in the middle of stirring or dicing something! Sara suggested you could hang it on a cabinet knob or fridge magnet. Genius. It didn't take long for me to find a recipe right up my alley: Italian Casserole. Mmm. BAM! A clean, easy-to-read and organized recipe. I love how she includes not only ingredients but materials (bowls, pots and dishes) you might need. Because let's face it -- girls (like me) who don't know how to cook sometimes can't figure that part out, even though most cookbooks assume you just KNOW what to use. Heck, I still regularly choose pots that are way too big for what I'm trying to accomplish. I made the Italian casserole last night and I was very pleased with the results! It was super-easy to put together and served up really well. Plus, my family also loved it, and you can't argue with a meal that pleases kids and adults equally! Yeah, I'm getting hungry just looking at it! Good thing it made plenty of leftovers, because I'm definitely having more for lunch today. Anyway, I'm excited to try the rest of the recipes in this book! They are all easy enough for anyone to handle and they look amazing. And I love how Sara has also kept healthy eating habits in mind as she created this recipe. Tasty AND good for your tum = win-win! 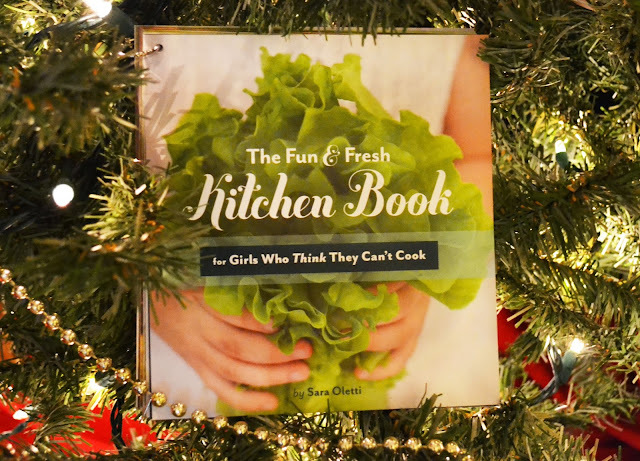 I think The Kitchen Book would make a fine Christmas gift for your favorite college student, homemaker, woman on-the-go ... really, just about anyone would enjoy having it in their kitchen! Lucky for you, Sara is offering my readers a 10% discount when they purchase The Kitchen Book from her Etsy page. Just use the code JENNA10 at checkout! And if you order by December 15, it'll arrive in time for Christmas. Get your copy of The Kitchen Book today! I need this book. I'm in my own little category of "pretends she can cook, but only eats cereal for all three meals". That would make such a great gift for a young lady! Love it! Thanks for reviewing it Jenna. Yum! What a great idea to have it tired together by one single ring. Very smart. I like cooking, but it's not my favorite of the domestic chores. That meal looks delicious!